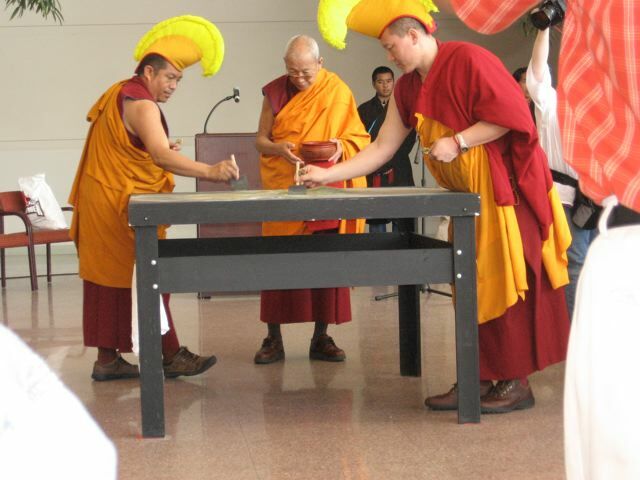 CEDAR FALLS, Iowa — The appearances in Iowa of the exiled spiritual and political leader of China-controlled Tibet, the 14th Dalai Lama, had a successive feel: first a closed reception for a few dozen donors on Monday, May 17, a panel discussion the next morning, then finally a solo turn that afternoon. One wanted His Holiness to hit it out of the park, but knew he’d likely further develop thoughts he’d begun earlier, yet the overall memory is one of satisfaction. Any disappointment would disappear as days melded and faded, much like a bright mandala brushed into a heap of now pastel sand. 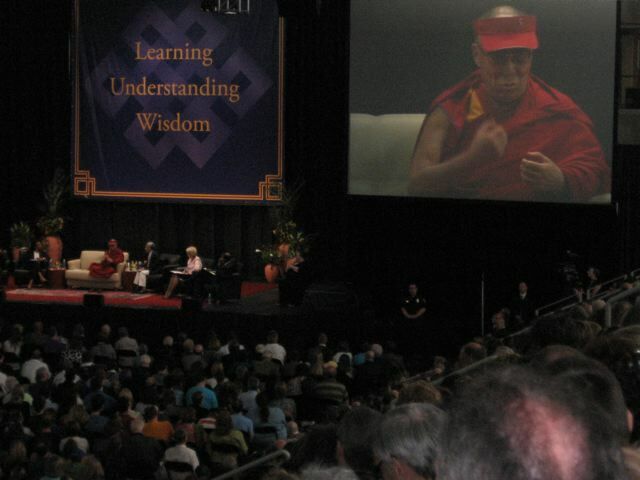 The title of the Dalai Lama’s keynote address,”The Power of Education,” indicated more a starting point for broad considerations rather than a subject, and indeed was the practiced ramble of an extraordinary mind. First, before the 2 p.m. start, the University of Northern Iowa Wind Symphony played. As a recorder and low brass player, I’m a sucker for bands, and the group had it a little rough. The spring semester was over by a week or so yet they hung around for this. They were playing before an audience of 5,000 in the basketball arena (the lofty acoustics of such are frustrating, too) settled noisily into the bleachers. The UNI president, Benjamin J. Allen, opened. He presented His Holiness an honorary doctorate. The academic collar-shawl kept slipping off the Venerable’s shoulders. Next, the band, accompanied by several choruses, including a children’s chorale, performed Joy, composed for the visit by UNI music professor Jonathan Schwabe, a setting of a Buddhist verse. It’s sung in English, and the translation also was in the program. It advises joy, peace, health, trust. It’s a handsome piece performed with quiet passion. Hearing Joy again would be a pleasure; maybe a podcast was made. Schwabe presented the Dalai Lama with the handwritten original score; in return he received a khata white silk scarf and a blessing. The Dalai Lama speaking in Cedar Falls, Iowa, on May 18, 2010. His Holiness is wearing an Indiana University visor, from a previous speech. Photo by Ben Pollock. CEDAR FALLS, Iowa — On this sunny late-spring morning, two lines stretch a couple of blocks from the gym. Between them was a rainbow of vendor tents, selling books, beads and other Tibetan items. All in the queues already have tickets, for reserved seats. We’re going through airplane-like security, four walk-throughs inside each of two sets of doors, to see the morning session of the Dalai Lama’s first visit to this state, the first minutes of which will be spent with the provost teaching him it’s Iy-Oh-Wah smoothly, not his phonetic guesses that make the crowd laugh. The scans and searches couldn’t go more professionally. We’re some 4,000 seekers: curiosity-, spiritual- or my kind, in-between. The McLeod Center is the basketball field house, not as big as Bud Walton Arena at the University of Arkansas at Fayetteville, yet year in year out this decade, the University of Northern Iowa seems to have a stronger team. There’s little doubt the Dalai Lama can fill the Walton next May (20,000 seats in a game configuration so maybe 15,000 for a speech). UNI sold out its afternoon session, 5,000 tickets. Every public appearance of His Holiness attracts Americans from hundreds of miles away. If there’s any softness in attendance it’s because his earlier appearances this tour were a few hours away: Madison, Wis., and Bloomington, Ind. 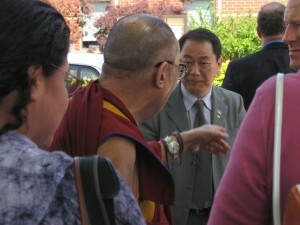 The Dalai Lama arriving in Cedar Falls, Iowa, on May 17, 2010. Photo by Christy Pollock. CEDAR FALLS, Iowa — I got this close to the Dalai Lama (spread hands about four feet) last week. If you can get that close, he might bless you, shake your hand, lift your khata (ritual silk scarf) from your neck and replace it or some combination. In this surprisingly small band of about 18 — not a Clintonesque rope line of hundreds — only about four received such a greeting. Some of we 14 later expressed disappointment, but most were like me, just delighted by the proximity. I gained no instant revelation from the “almost” and, being rational most of the time, I am confident none would have come from direct contact, any more than my writing improved after Salman Rushdie the other year signed my copy of The Satanic Verses, or how last month at the local library Mel Bartholomew shook my hand and signed his revised Square Foot Gardening for me. Yesterday I saw a rabbit eye the lettuce in my raised bed, because he can’t read. My Beloved and I drove from Arkansas, combining a hometown Iowa visit for MB with two hours further to UNI, also her alma mater. University of Arkansas at Fayetteville Adjunct Instructor Geshe Thupten Dorjee, a Tibetan monk (“geshe” corresponds to Ph.D. in Tibetan education), and his sponsor, English Professor (also Fulbright Honors Program Director) Sidney Burris, every fortnight for months have traveled here to teach Buddhist religion and Tibetan culture, and advise administration and faculty on the pending holy visit. MB has gotten close to the two men and the spiritual group they lead; sometimes I tag along. Due to the duo, perhaps 20 other Northwest Arkansans carpooled to Cedar Falls as well. News that the Dalai Lama is scheduled to speak at UA next May was confirmed only recently, after everyone’s travel plans were set.